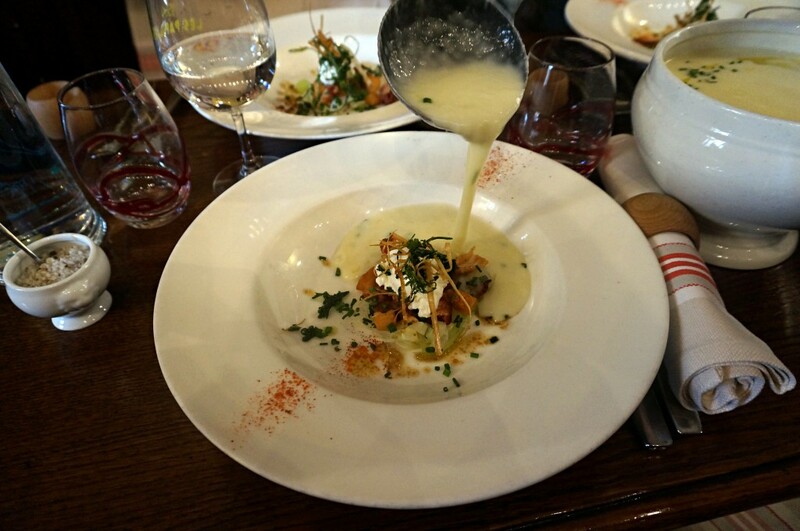 To visit France and not to dine at one of the haute cuisine restaurants would be a serious mistake. 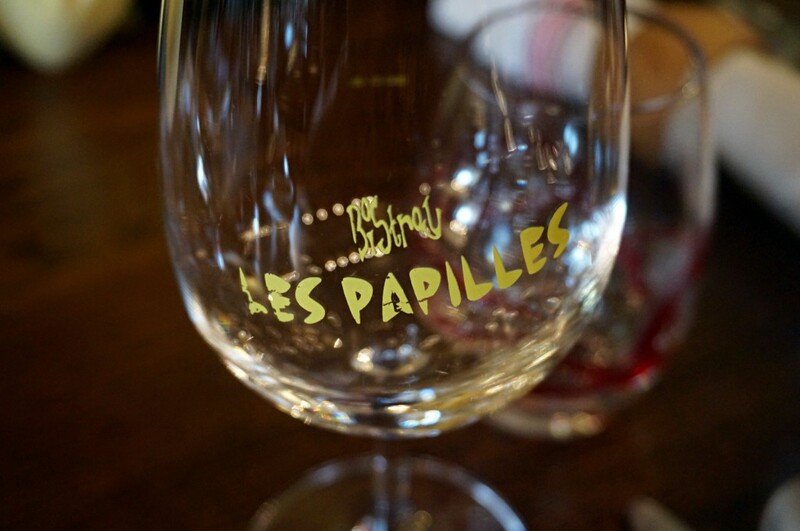 We’ve chosen the restaurant Les Papilles, which the owner Bertrand Bluy describes as French bistro. From Montparnasse to the Luxembourg Gardens, near which hides a small homely restaurant of the magician Bertrand, it is easy to go by walk (last year I went down to subway’s dungeons only twice — on the way to the hostel and back), but it is not as close as you could think. Somewhere near the Seine flows, the majestic Pantheon remains behind, and if you pass slightly forward, you will stumble upon a bright yellow sign. Above the entrance you can see a small sticker with the Michelin man. We are here. Michelin stars have awarded to restaurants for two hundred years and even one star makes the place exceptional. You see, here in Russia there are no places mentioned in this guide, so I wasn’t able to compare my experience. Small room is packed with fifteen tables with really narrow distance between them. We are among the first to arrive and have time to make a small talk with the owner of the place, who is charismatic smiling and eagerly rubs his hands telling us about the pork backed for the most of the night to be served to us this evening. Left to us are sitting talkative French, at the right there are Chinese with puzzled look and after the low hurdle I can hear the Germans. People from around the world are coming here to taste the masterpieces of Bertrand Bluy. 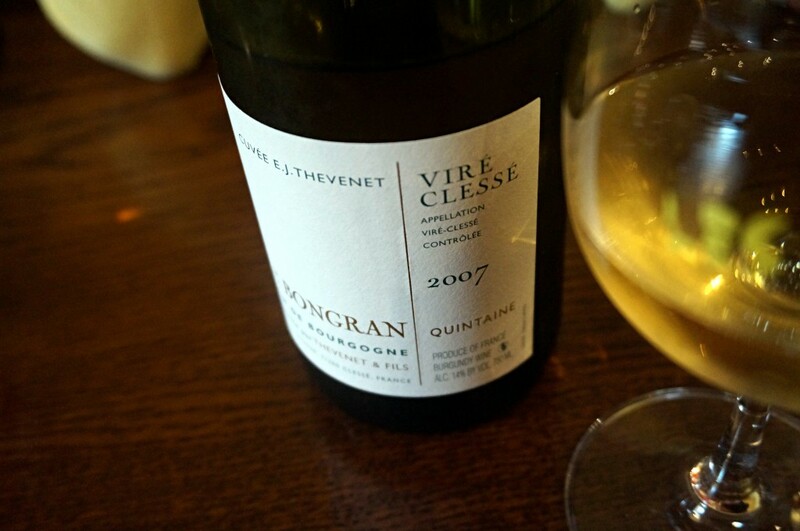 There is no menu, because everyone trusts the chief to bring both food and appetizer (we got a bottle of wonderful burgundy 2007 Vire Clesse Cuvee EJ with a distinct floral aroma). 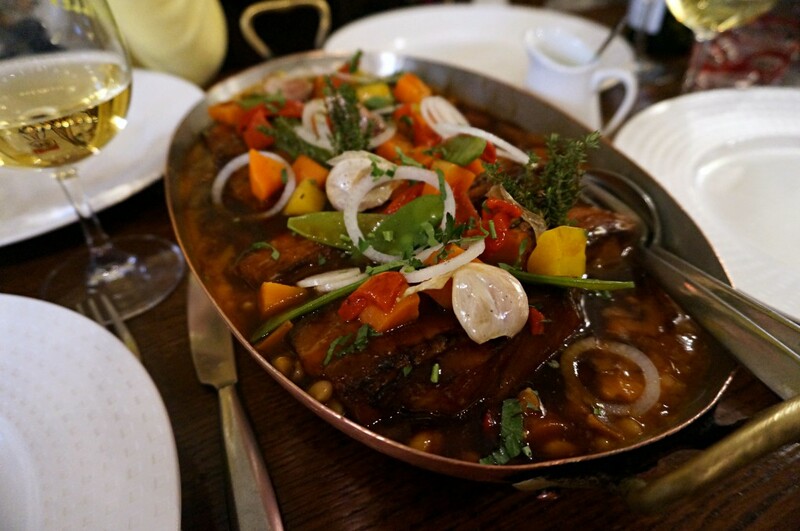 and when it evaporates from the plates — without any time for a rest they take a third of a not so large table for a huge frying pan with pork and vegetables. The meat is so soft that seems like it was prepared by the method of sous-vide, but no — the pork was roasted entirely, slowly turning over the fire for hours. 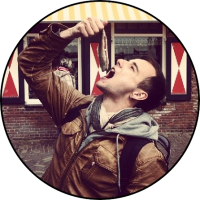 The next is a gastronomic tour in the world of French cheeses. 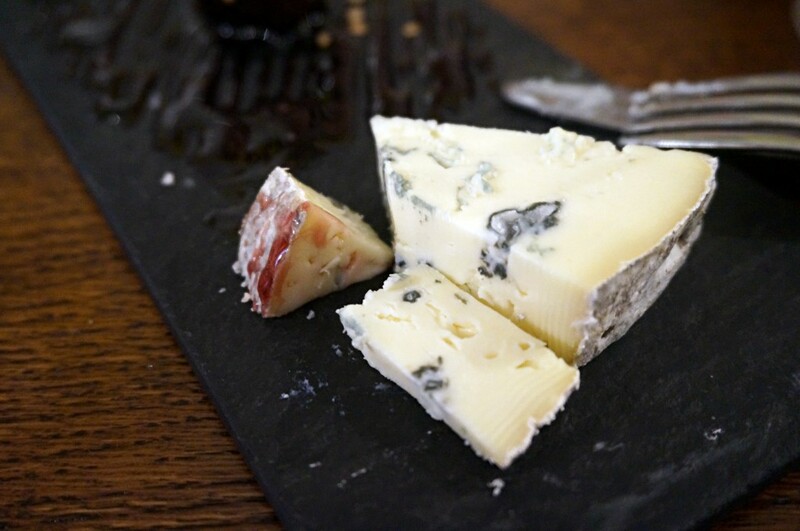 Soft, melting on the tongue blue cheese is served with a sauce consists of boiled in red wine dates. 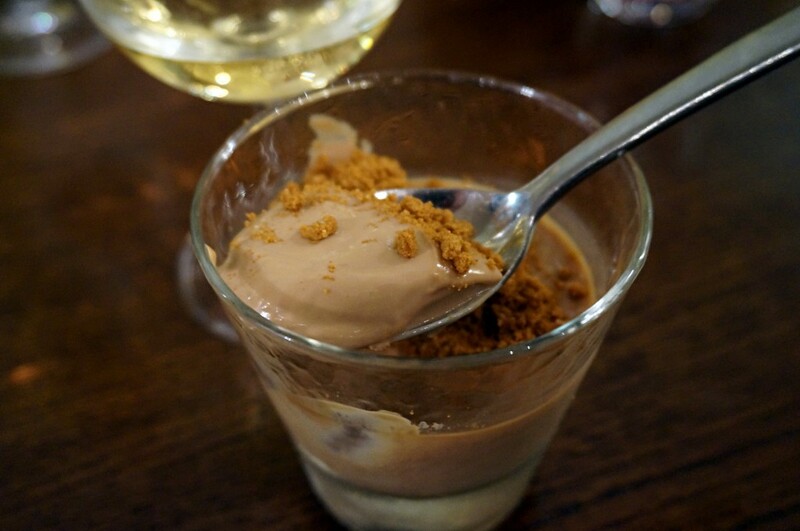 For the last chord there is a perfect, as light as passed through a siphon (or maybe really passed through a siphon) panna cotta, sprinkled on top with an “earth” from the sweet crumbly mass. This mass prepares surprisingly easy — just mix butter with grated biscuits, cool them a bit and add wherever you want. For example, you can compact the mass in a form and used as a basis for a cake, which does not have to be baked (some cheesecakes, for example). Cooking for someone is much nicer than for yourself: apparently, this is the main idea at Les Papilles for everyone starting from the waiters to the cheerful chef in the kitchen. You see, he was really happy to make for me a little master class on cooking of mirepoix for a thick and fragrant sauce to the aforementioned pork. 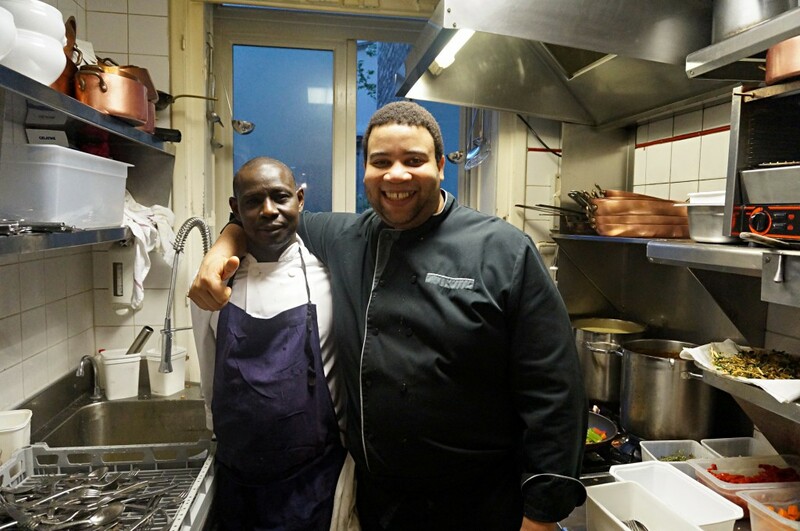 By the way, at the kitchen I was able to meet with Ulric “Tom” Claude (at the right), from 2006 he is in charge of the kitchen with his sous-chef Sarko (at the left). Bertrand Bluy was born in September 1972 in Toulouse — it’s not only the birthplace of rugby, but also the heart of the southern French gastronomy. In the future these two things had become his main hobby. At fourteen years Bertrand went to school at the hotel Biarritz in order to develop his talent, and then became a pastry chef at the hotel du Palais. From there, the chief moved to Paris, where for some time he worked under the direction of Pierre Hermé — one of the world’s most famous manufacturers of sweets, and then traveled around the country, until 2003 when he opened his own restaurant, Les Papilles, which can be translated to English as “taste buds”. Surprisingly versatile kitchen, light wine and cozy atmosphere of a small family party definitely do the trick. That is why leaving (or better to say, rolling out?) in the night mist of the city, I feel fed too well, but very happy.